"I don’t need to be skinny just because my friends are skinny. I don’t have to skip lunch just because my friends skip lunch. I don’t have to jump off a cliff just because my friends jump off a cliff. "You’re going to be able to counter some disordered thoughts easily, while others will take longer to root out. You’re going to let go of some behaviors more quickly than you let go of others. That doesn’t mean you’re failing or that you’re flawed or bad at recovery. It’s just how recovery works. You win some fights faster than others." 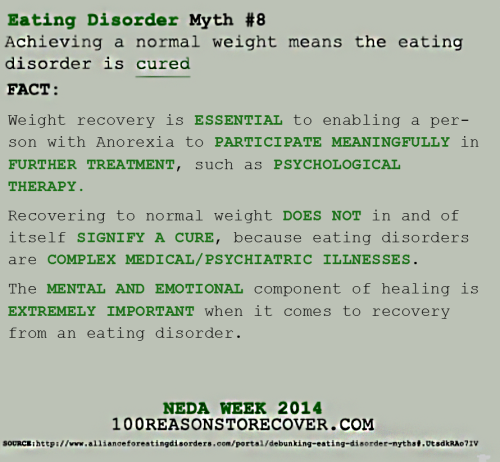 But ignoring your eating disorders voice and doing exactly what seems so scary is the essence of recovery. It is what separates being in active recovery and not being in recovery. It starts with forcing yourself to do what you fear. you are painfully aware of every inch of your body. was not made to subtract from. it doesn’t mean it’s the right thing to do. Best time in the day is to open my dashboard and find that you've posted something again! !